The Millennium Tree group - Autumn 2003 after a hot dry summer! 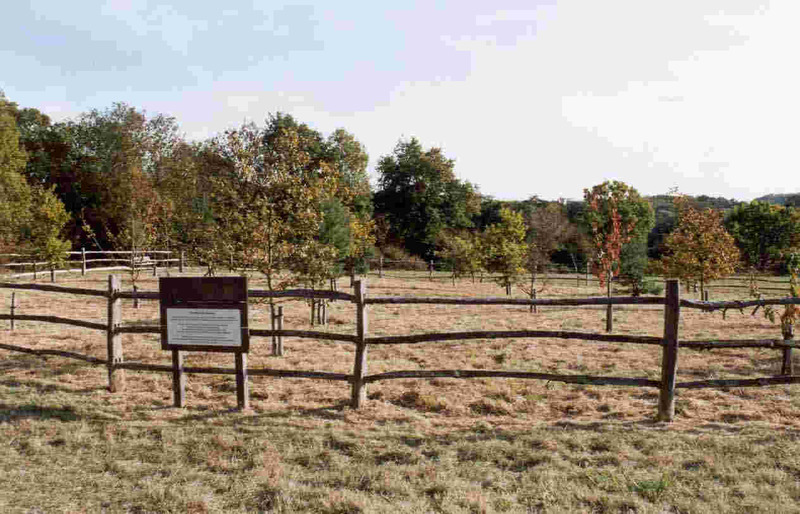 This group of trees have been planted with a variety of species to celebrate the Millennium. They have been arranged into three, concentric circles and consist of Oaks, Field Maple, Cherry and Scots Pine. The numbers of and types of trees were selected initially to acknowledge the fact that the Millennium was 2000 years after the birth of Jesus Christ. The Oaks were chosen for this role due to their strength and longevity. This is the area where, with our agreement and subject to some simple rules, the ashes of deceased visitors to the green may be scattered. If you would like further details on our Policy on this issue click here. Visitors to The Green may come up with other interpretations for the combinations of the numbers in this group and a few ideas are set out below. The 12 Oaks in total could refer to the number of months in the year. 4 is the number of weeks in a lunar month, and the number of seasons. 9 is the human gestation period in months. 3 is considered a lucky number to many (e.g. 'coins in a fountain') and is the number of wise men who visited the infant Jesus. 18 is the age of majority in the UK. 6 is the number of faces on a dice, and the number of continents.